Georgia was a huge influence on President Franklin D. Roosevelt. He first came to Warm Springs in 1932 to seek therapy in the mineral-rich waters. 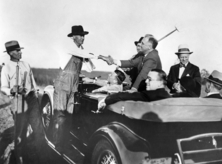 His experiences with rural farmers led to many of his New Deal policies. On April 12, 1945, FDR suffered a fatal stroke while posing for the now-famous "unfinished portrait." Today, you can tour his modest vacation home and museum at the Little White House Historic Site, plus stay overnight at F.D. Roosevelt State Park. Every April 12, Roosevelt's Little White House hosts a commemorative ceremony in honor of this influential president. Next year, Fort Yargo State Park will sport a new visitor center, complete with educational displays, a gift shop, meeting space/classrooms and a patio. Join us at 1 p.m. on March 3 for a public ground-breaking ceremony for the 5,859-square-foot facility. Afterward, be sure to check out the park’s hiking and biking trails, disc golf course or fishing lake. You can also see the namesake fort, built in 1792 by early settlers. Fort Yargo is located in Winder. The “2018 Guide to Georgia State Parks & Historic Sites” is a helpful resource for planning spring break, summer vacations or even a family reunion. The booklet is filled with tips on the best hiking trails, fishing spots, cabins, wedding venues and campsites. 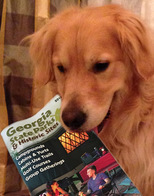 For a free copy, call 770-389-7286 or stop by any Georgia State Park or State Historic Site. Planning to visit often? Pick up an Annual ParkPass or join Friends of Georgia State Parks and you'll save on parking fees. Enjoy a peaceful winter escape while saving on your wallet. This February, save 30% on fully equipped cabins and cottages, Sunday through Thursday nights. Snuggle up to a cozy fire and sip coffee on your private porch. Golfers may want to check out Hard Labor Creek State Park (pictured) and The Creek Golf Course near Social Circle . Their 18-hole course is a favorite for its challenging layout, natural setting and great rates. For a list of participating state parks and details, check GaStateParks.org or call 1-800-864-7275. Use promo code COTT18.